The current hubbub in the media concerning the news that the Nokia Lumia 710 will in fact land at T-Mobile is understandable, if predictable. The phone represents the start of what Nokia hopes will be its glorious, and lucrative return to the US market. Let’s not, however, get lost in the hype. You have to view today’s news from the following perspective: Nokia managed to land its derivative handset at one lesser (in terms of size) carrier here in the States. That is a step, but it is a very small one. Given that we, the press, fret about aggregate Windows Phone handset sales, how well will the Lumia 710 fare on its own, especially given Microsoft’s spotty record of point-of-sale presence? Here is a fact: The Lumia 800 sells itself. By that I mean, given the massive reaction to the device (even here at TNW), at its final destination in stores, it can move itself. This is the product of its attractive design, essentially. The Lumia 710 does not have the same pull as it is a lower-cost device whose status as such shines through; it’s a solid phone, but hardly a looker. [T]he company has delivered a 4G LTE version of its Lumia 800 handset to both Verizon and AT&T, who are testing the device. Of course, Windows Phone does not officially support LTE. In the past Microsoft, has been demure on stating when formal LTE support will be released. While Verizon and AT&T are both said to be testing the special Lumia 800, that does not mean that either is destined to carry it; mobile providers test more phones than they carry, logically, as they must weed out the weak to find the strong. According to a lenghthy report in CNet, AT&T is perhaps the strongest potential suitor for Nokia’s hardware. The last time we checked in on the rumored Nokia Lumia 900 it was just that, a rumor. Now, a very illuminating Twitter conversation between the Swisscom Care account and a normal has the phone company both confirming that the device exists, and that it will carry it in February. It could be that Nokia is having a hard time getting the Lumia 800 placed, perhaps already having sorted the 900. Of course, that is pure guesswork. My hunch is that Nokia hasn’t done diddly with the Lumia 900 stateside, and AT&T and Verizon are both content with their current lineup of WP7 devices. 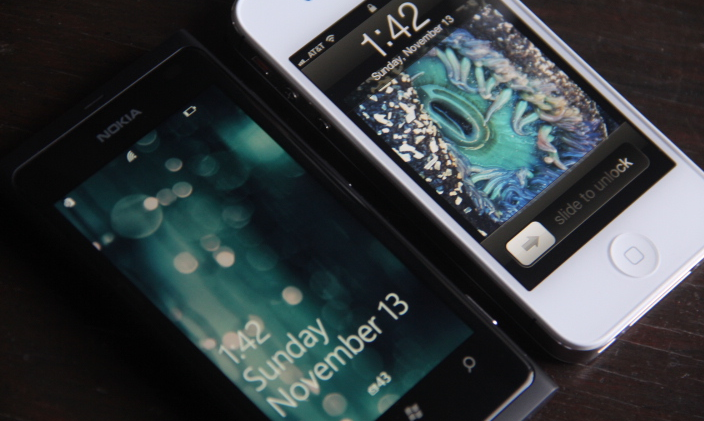 Even more, both already have ‘halo’ devices in place, something that the high-end Lumia 800 would complicate. This explains why either have yet to sign a contract with the Finnish giant and score 800s for their customers. The road remains uphill for Nokia. They are hardly out of the gate.